360 degree panel rotation, with locking system on each side. 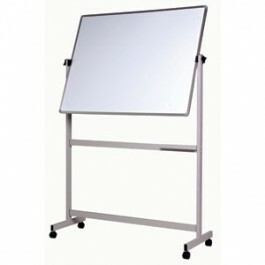 Vista Double Sided Mobile Whiteboards are double sided Verve Trim Whiteboards on a mobile pivot frame. Easy to move as required and has lockable castors. The Board pivots 360 degrees with locking system on each side. Choose from either the Porcelain or Commercial magnetic whiteboard surface. Double-sided magnetic writing surface that accepts magnets and magnetic products. Double sided 300mm pen tray. The frame colour is APO Grey aluminium with 2 lockable castors. NB: Porcelain Boards can be printed to your needs or a Chalkboard surface is another option – Just ask us.